It is well known that the angular distribution of sputtered particles from a magnetron cathode can vary from one material to another. A lesser noted yet significant phenomenon is the changing characteristics as a target ages: the angular distribution for a deeply eroded target can be significantly different from a fresh (flat) target surface. Usually, a flat target on a magnetron cathode tends to produce an angular distributions that is characterized as "under cosine" or "heart-shaped". 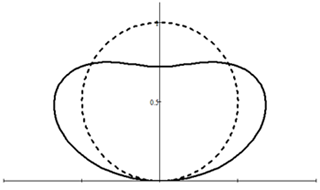 As a target becomes eroded, its angular distribution becomes more and more cosine-like. The figure below gives a comparison of these two types of angular distributions. It should be no surprise that a sputter-deposition process that is optimized with a new target can yield increasingly poor thickness uniformity as the target erosion becomes more and more severe. With V-Grade 5S we can not only understand and quantify the change but also find correction measures. (The program provides convenient modeling of various types of angular-distribution functions.) 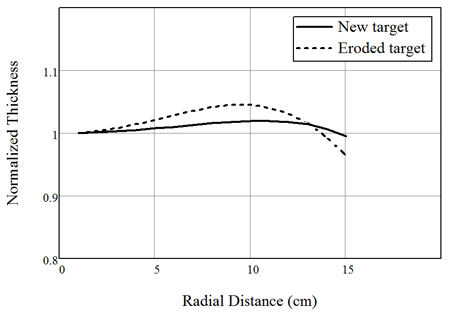 The following figure shows the thickness distributions resultant from a new target with heart-shaped angular distribution and an eroded target with a cosine distribution in the same sputter-deposition arrangement as in Case S1: tilted magnetron cathode coating a rotating substrate holder. For the new target the nonuniformity is 1.3%; for the severely eroded target the nonuniformity worsens to 4.0%*. +/- 4.0% wherever "+/-" sign is dropped for conciseness. Measures can be taken to correct the nonuniformity, particularly for eroded targets, so that qualities of the coating can be maintained throughout the life of a target. Please view the next case (Case S3) for some of the remedies.